Saturday June 24, 2017: Another fabulous sunny morning greeted us. Our run today was from York Harbour to Newburyport, a distance of just over 24 nautical miles. Our departure was timed for high tide slack water (about noon) so we should not have to worry about the strong current in the river. Newburyport Harbour is located on the Merrimack River, about 3 1/2 miles up from the river’s entrance. As we approached the river, we could see miles of beautiful sand beach along the shore, accompanied by spectacular homes. The closer we got, we could see lots of people on the beaches enjoying this first sunny Saturday following the end of school the previous day. Cruising guides warn that with adverse winds, this entrance into the Merrimack River can be very treacherous. There is a light on a 47’ tower at the entrance and when the coast guard have it flashing it is considered to be unsafe to enter or exit. There is a destroyed remains of a hull sitting on the break wall as a reminder to all as to what can happen. For us, while the wind was relatively light, the strong outgoing tide and river current from the narrow river caused substantial “standing waves” at the mouth of the river. This, combined with an endless stream of boats (speed boats, sail boats, fishing boats, slow boats like us, recreational fishing boats criss crossing the narrow channel etc), it was chaos! While we’d booked a mooring ball, upon arrival at Newburyport and seeing the strong current, we changed our minds at the last minute and opted for a dock. A harbourmaster dock hand did a terrific job helping us land, handling our registration and giving us a rundown on the old port area. Newburyport is a small city of just over 17,000 with a rich, history as a seaport that was first settled in 1635. In the early days, fishing and shipbuilding were its primary industries. In the late 1800’s, Merrimack Arms & Brown manufactured the famous Derringer pistols. Newburyport also developed a whaling operation as did many east coast fishing ports. Newburyport was also active in the underground railroad, rescuing blacks from slavery and the community was an early adopter of the abolitionist movement. Following a relaxing happy hour aboard Wings, we set off to explore the old port area and make a reservation at the Sea Level Restaurant. Newburyport has done a magnificent job of breathing life into what was a rundown section of the community. The old port area is now thriving with a waterfront park, new harbour front docks, moorings, washrooms and showers, renovated / restored historical buildings, restaurants, boutiques, bakeries, ice cream shops, galleries, playgrounds and more. On this first Saturday following the end of the school year, the old port was packed with people enjoying the fine weather, watching the boats or getting out on the water on tour boats. It was great fun exploring the downtown and building up an appetite for a terrific seafood dinner at the Sea Level restaurant. The challenging navigation of the river and docking was well worth the effort. Sunday June 25, 2017: We were up early and I took advantage of the dock and water supply to give Tug’n a good wash to remove as much of the dried salt water spray on the hull, deck and cabin as I could, followed by a wipe down. After filling our water tank and having a brief crew meeting with Bob and Jan, we bid adieu to Newburyport and were on our way to Manchester by the Sea under a cloudless sky, warm temperatures and an ocean that for much of the run was windless and almost smooth (just a light ocean swell). Who knew the Atlantic Ocean could be so comfortable? Exiting the Merrimack River was almost as chaotic as our arrival with a flood tide meeting the river current and all manner of boats making their way in and out of the river in a very haphazard manner. For others thinking of stopping at Newburyport by boat, we’d recommend a weekday. 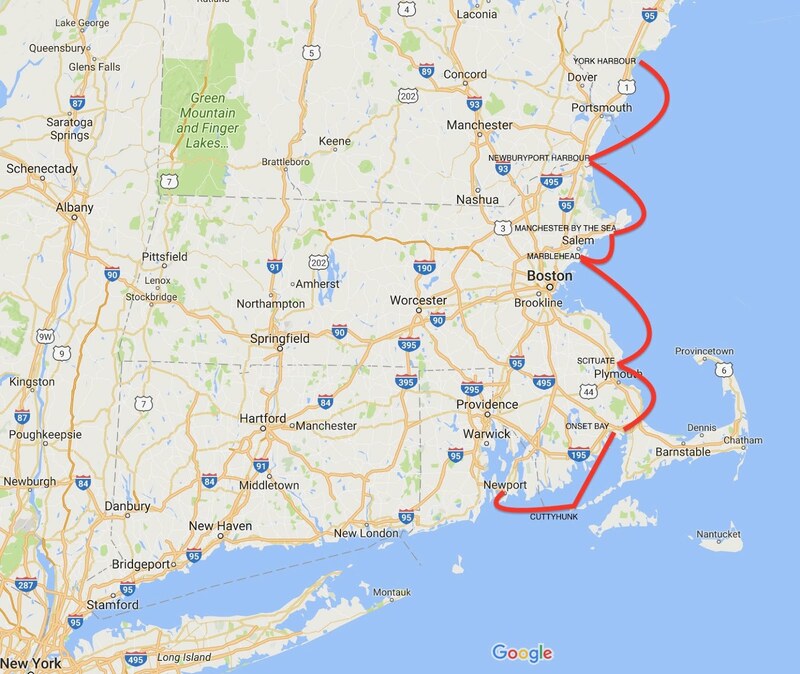 To reach Manchester by the Sea, you have to head out around Cape Ann peninsula and the seaport of Gloucester to the well protected Manchester Bay and the town of just over 5,000. Like many communities along the New England shores, Manchester by the Sea was first settled in the early 1600’s and thrived for over 200 years as a fishing community. However, starting in 1845, Manchester by the Sea began to become the summer colony of choice for Boston society. Its lovely shoreside summer homes (mansions) certainly provides great eye candy for those on boats moored at the Manchester Yacht Club. We felt like royalty receiving a free night’s mooring and having the club tender take us over to the town dock to explore the downtown, pick up some provisions (and a delicious ice cream from Dusty’s) and then get a lift back to our boat in the mooring field. Wonderful treatment. Today, most of us think of the movie when we hear the name “Manchester by the Sea”, but our driver on the yacht club tender was quick to point out that the movie does not present the town in a good light and in fact many of the scenes in the film were done in other communities. Indeed, we found he was correct - the town is quite lovely, quaint, picturesque and fun to explore. It is well worth a stop by boat or by car. Fran bought a coconut crusted haddock fillet in town that we cooked on the BBQ that night. What a wonderful treat. Afterwards, we managed to connect to the yacht club wifi and watch the last two episodes of Season 5 of “Call the Midwife” on Netflix. For anyone who hasn’t seen it, this is a terrific show. Monday June 26, 2017: Late last night, we were hit with a 20 minute squall; l with winds up to 35 knows followed by rain. Thankfully it didn’t last long. It did provide a nice wash of our deck and cabin which I wiped down under this morning’s beautiful sunshine. After several days of investigation, along with input from our boating friends Lee and Barb, we finally had a plan for transiting the Cape Cod Canal on Tuesday. More on the canal later, but to prepare for the crossing, we were headed to Scituate, Massachusetts today so we’d be in a good position for entering and transiting the canal. En route today, we’d planned a lunch stop at the town of Marblehead, which is famous throughout the yachting world as the “Yachting Capital of America”. Historically, it was a fishing village and today, the harbour maintains a small fleet of lobster and fishing vessels. But now more than ever, it is a key layover port for cruising and racing yachts from the world’s most serious yachting circles. The famous Marblehead-Halifax race alternates with the race starting in Marblehead on even numbered years. Scanning the harbour, one sees a fabulous array of cruising and racing yachts. More than that, the people of Marblehead are the most friendly and helpful you could ever want to meet. The Harbourmaster’s Office were wonderfully accommodating, agreeing to letting us tie up our two boats on their dock for a couple of hours while we went ashore for lunch and a brief walk about the town. They pointed us to dine at Maddies Sail Loft for lunch and it turned out to be a restaurant/pub frequented by locals, with a great menu and atmosphere. It was almost empty when we arrived but within a half hour, it was almost full with a group of locals who all knew each other, kind of like walking into a yacht club atmosphere. The food was terrific and extremely reasonable and while we didn’t have any alcohol for lunch, we witnessed a bartender poring the most generous drinks we’ve ever, ever seen. One wonders whether the other patrons ever made it home that afternoon. We enjoyed our after lunch stroll, visiting a gallery that was running an art class, the Ships Lights’s store and snapping photos of some great examples of well maintained New England architecture in this quaint town. By 1345 hours, we were underway again for Scituate on a very calm ocean. We passed Boston off in the distance, not stopping as Fran, Bob and Jan had already spent time there. We will have to return by car some time so I can see this most famous city. In Scituate, right after we were settled on the yacht club’s mooring balls, we took the club tender into town for a visit to the grocery store and a walk about town, before returning to our boat for dinner and an early night. 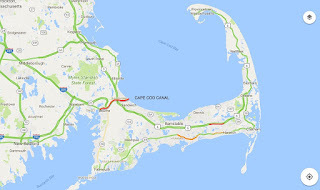 Tuesday June 27, 2017: Cape Cod canal is a man made canal through the southwest corner of the Cape Cod peninsula, connecting Cape Cod Bay in the north to Buzzards Bay in the south. 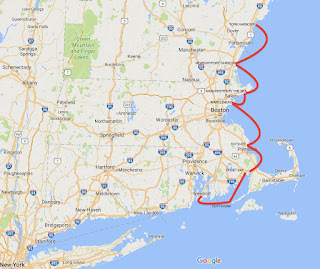 The canal is 7 miles long, traversing a narrow neck of land that joins Cape Cod to the mainland. For about 14,000 boats per year, it shaves 137 miles off a journey along the coast. It can accommodate vessels up to 825’ long, 135’ high and with 32’ of draft. The tide on the Cape Cod Bay side is 9’ and on the Buzzards Bay side the tide is about 4’ and this difference creates swift moving currents that reach up to 5.2 knots and change direction every six hours. Apparently, the canal is also used by the occasional whale and dolphin. In the year 1623, the idea of a canal was first considered by the Pilgrims who scouted the land for potential routes but went no further with the idea. Then in 1717, the Jeremiah Gutter Canal was created, some distance to the east across a narrower portion of the cape and it remained active until the late 1800’s. The first attempt to build the canal in its current location happened in the late 19th century, but the organizers ran out of money and the project was not completed. In July 1909, construction of the canal finally restarted on a route taking advantage of, and widening of the Monomet and Scusset Rivers. Work was slowed by mammoth boulders from the ice age that required divers to blow them up. Also, winter storms regularly halted dredging. The canal was finally completed in 1916 as a privately owned toll canal that was 30’ wide and 25’ deep. The canal was so narrow and difficult to navigate, causing numerous accidents and tarnishing its reputation quickly. On July 21, 1918, a German U Boat surfaced and sank a tug and four barges in nearby Orleans and this prompted the government to take over operation of the Cape Cod Canal by Presidential Order. The government maintained and dredged the canal until 1920 and then bought it in 1928 to operate as a free waterway. The government undertook widening the canal between 1935 and 1940 to its current 480’ width and 32’ depth. During WWII the canal provided safety from U Boat attacks and Patrol Boats and Coastal Artillery provided further protection. On June 28, 1942, a cargo ship grounded and sank in the canal, shutting it down and exposing shipping to increased threat of torpedo attacks. SS Alexander Macomb was torpedoed July 3rd and sunk killing 10. The canal reopened July 31st after the cargo shop was removed with the help of 17 tons of dynamite. To transit the canal safely, it was recommended we enter the canal at slack water and take advantage of the current that would begin to flow from east to west shortly afterwards. After some investigation and calling the canal engineers to sort out conflicting information, we determined we needed to start our transit at 1311 hours, so we departed Scituate just after 0900 to time our arrival for slack water, just before the start of the ebb current. We actually arrived five minutes early and faced a small current against us, but it turned in our favour right on time and before long, it was pushing us along at about 3 1/2 knots. The shores of the canal were well used with bicyclists, people walking the shoreline trail, fishermen and more. The other key planning factor is ensuring you don’t enter Buzzards Bay when there is a strong SW wind opposing the outgoing current. Knowing this was going to be the case, we heeded another of Lee and Barbara’s recommendations to pull off the dredged canal near the west end and anchor in Onset Bay. Over the last few hours the day had turned cloudy, drizzly and cool and it was a great anchoring recommendation. However, by 1700 hours the sun was back out, the temperature was up and we got to sit out in the cockpit for happy hour. How lovely! 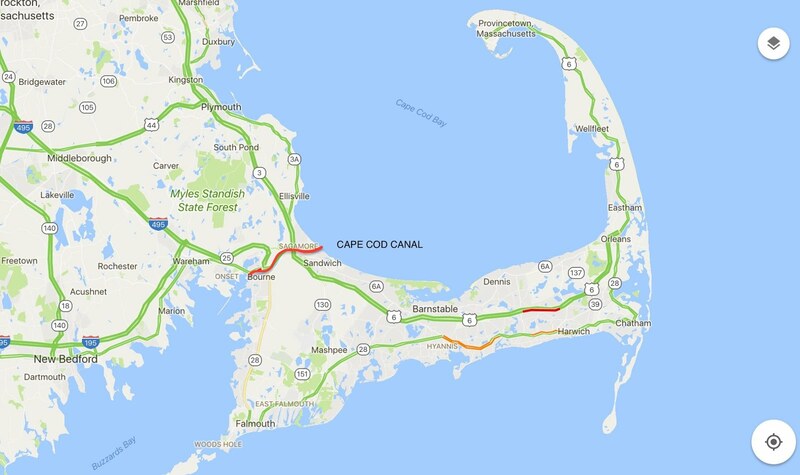 Wednesday June 28, 2017: The Elizabeth Islands extend about 14 miles off the southwestern end of Cape Cod. They are of varying size and all are privately owned by the Forbes Family, except for Cuttyhunk Island. Cuttyhunk is the westernmost of the island chain and it was named from the Indian word meaning “land’s end”. It was discovered in 1602 by English explorer Bartholomew Gosnold, who proclaimed himself ravished” by its beauty. It presents a primitive island atmosphere and an easy stopover for those en route from the mainland to Martha’s Vineyard. We were up at 0500 and underway by 0600 for an early morning run from the Cape Cod Canal to Cuttyhunk Island in the hopes of getting there in time for a mid morning brunch at the Cuttyhunk Fishing Club. This club was founded in 1894 and didn’t open to the public until 1998. It is a rustic club with furnishings, fittings and a ancient library, pretty much just like it was when President Roosevelt make the trek here for a fishing trip. We did in fact make it here in time and enjoyed a superb breakfast while sitting on the front porch looking out over the Elizabeth Islands and Vineyard Sound. It was a completely delightful experience. Just as we were paying our bill, we sighted Encore, a Nordic Tug owned by friends Lee and Barb from Rhode Island, who’d come out by boat to meet up with us. We’d met them in Quebec City last year and cruised together right through to the Bras D’or Lake. Today, we met them in the Cuttyhunk Island harbour after they’d anchored their boat and together went for a hike to the highest point on the island to enjoy a 360 degree view to the surrounding waters and islands. It was really quite a breathtaking view to take in as we chatted and caught up with Lee and Barb. Later we enjoyed happy hour together on Wings and Lee helped us mark possible future anchorages on or charts, right through to New York City. After dinner, we had a further get together on Encore for Barbara’s Strawberry Shortcake - the end to another perfect day. Newport Harbour is massive and I’m sure my heart skipped a few beats as we made our way towards our designated floating dock. It turns out, our stay here coincided with a 40th anniversary rendezvous for owners of Kadey Krogen yachts and they had a very large turnout making their section of the docking look like a boat show. The pictures below will tell you all you need to know about the size of the boating community and boats here in Newport. Newport is a seaside community founded on Aquidneck Island in Rhode Island in 1639. It is known as a New England summer resort community and it is famous for its mansions. Newport grew rapidly in the 17th and 18th century, its growth spurred on by the arrival of Portuguese Jews who fled persecution in Portugal. They brought capital, business skills, trading contacts and knowledge which helped Newport to become a wealthy trading centre. These immigrants also introduced sperm oil from whaling to the United States. The Aaron Lopez family became fabulously wealthy with 150 ships involved in trade, plus the manufacture of candles, ships, barrels, rum, chocolate, textiles, clothes, shoes, hats and bottles. Rhode Island also became the most active port in all of United States in the slave trade, with 60% of slave-trading sailings launched from this tiny island. Many laws were being broken by this activity and quite a number of Rhode Island families made substantial fortunes in the trade. Many local merchants bought shares in these illegal voyages. Today, Newport is a major tourist centre and boating centre with every conceivable boating service and expertise available. Also, the downtown is filled with a wonderful array of restaurants and boutiques as well as companies catering to the boating community. Upon our arrival, we were met by Danielle in a Zodiac to help us get to our floating dock / mooring. Later in the day we took a tender across the large harbour to downtown Newport to explore the community. Later we met up with Lee and Barb again for dinner at Lucia Italian Restaurant for a lovely dinner. Friday June 30, 2017: As planned, Lee and Barb picked us up by car in the morning and took us on a variety of errands before we did a driving tour of the island to see many of the great mansions, parks and different harbour views. The large mansions were really quite mind boggling, both the size and beauty of the structures and the magnificent landscaping that surrounded them. It was beyond our ability to imagine how a family could live in one of these mansions; we think you would feel like you were wandering around in a luxurious hotel all by yourself. Mid afternoon we said our good byes and thanks to Lee and Barb for all their generous help and were back on our boats with provisions, a full propane tank and a full tummies. What a great time we’d had seeing Newport and catching up with Lee and Barb. Saturday July 1, 2017: HAPPY CANADA DAY. HAPPY 150TH BIRTHDAY TO CANADA. Fran and I dressed in our Canada 150 T Shirts for the day. We had a FaceTime call to wish our youngest grandchild Alex a Happy 2nd Birthday. We got lots of “Happy Canada Day” wishes from our American Boating friends and it all felt very special. Today we made our exit from Newport. As strong winds and big waves were dominating Buzzards Bay and Long Island Sound, we headed further into Narragansett Bay to the Prudence Island anchorage. It is a large and popular anchorage and this being a holiday weekend, many boats streamed in here all afternoon as we relaxed at anchor on a rather cloudy and dull day. But its always lovely to swing on the anchor in a well protected anchorage and it put smiles on our faces as we reflected on how lucky we are to be doing what we are doing.